Poisoned Apples are a specialty item used by the Dark Brotherhood to assassinate people. These items will kill any non-essential character who eats them, no matter what (even if the target is immune to poison). Once eaten, the Poisoned Apple applies a script effect that adds the Ability "Damage Health 10 points" to the victim. Since the damage being done is now a character's Ability, there is no way to resist, cure, or dispel it after it's activated. You will not incur any bounty for people killed using poisoned apples. Poisoned apples cannot be duplicated in the Arch Mage's Enchanted Chest. As an alchemy ingredient, poisoned apples are nearly (though not entirely) useless. They can be combined with another script effect ingredient or master-level alchemists can make a single ingredient potion using poisoned apples. However, the resulting concoction is a potion, not a poison. The only possible way to use the potion is to drink it yourself and thus kill yourself. However, if you save and reload the game before drinking the potion, the potion's scripted effect will no longer take effect when it is consumed. However, poisoned apple potions do have one asset to them: They can be renamed. Since the potions are weightless, they can be reverse-pickpocketed into a person's inventory. If you rename the potion with two A's at the beginning and stick it in their inventory, they may drink the potion first, effectively removing the requirement to loot their dining area and inventory of all other food items. 10 samples are in a barrel in Fort Farragut. During the Dark Brotherhood quest The Purification you are sent to Fort Farragut and will discover the poisoned apples. 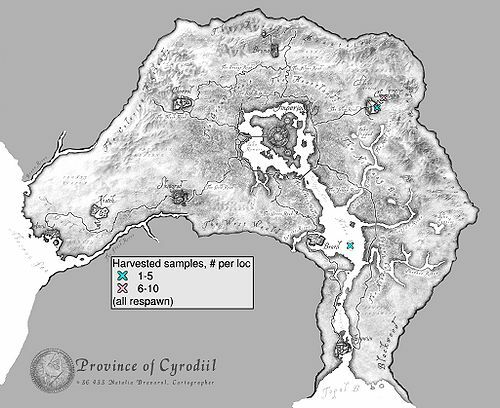 5 samples are available for purchase from M'raaj-Dar in the Dark Brotherhood Sanctuary in Cheydinhal (only available to Dark Brotherhood members). Break into a target's house while they are sleeping. Then proceed to place the apple in their inventory while using the pickpocket options. Next, rid the room, or house, of any remaining food. If your pickpocketing skills are not sufficient to place an apple in your target's inventory, you may instead place an apple on a table or shelf (after removing any existing food in the area) and wait for the target to pick it up. This is not recommended in areas where other NPCs could possibly pick up the poisoned apple (unless you don't mind a few accidental deaths). It may be safe, if only one person is eating, to drop it in front of them to eat. It may be best to save before placing an apple if accidental deaths are not wished for. Now, finally, you may wait. Depending on the target, it may take as long as one day. If you search the now dead target's body, you will find the apple is gone due to the simple fact that they ate it. A small number of NPCs are effectively immune to poisoned apples because they carry a self-replenishing supply of food, which they will eat in preference to the poisoned apple. In addition, some NPCs (such as Sibylla Draconis) never eat, so can never be killed with this method. On the PC, if you've managed to eat a Poisoned Apple and want to remove the effect, you can use the following Console command to reverse it: player.removespell 00009617. NPCs that respawn (like guards and bandits) will pass this effect on to their next respawning copy. This will result in these people dropping dead for no apparent reason. This is because the script effect does not tell the game to remove the ability after the actor is dead. If you consume a poisoned apple, you will take damage at 10 points per second indefinitely. Since the ten poisoned apples in Fort Farragut respawn every three days and each is worth 300 gold, selling the apples is a good way to make gold. Esta página foi modificada pela última vez à(s) 19h48min de 30 de dezembro de 2015.